Community in the Foothills. It was a warm and clear August evening prime for exploring. But when one lives in the middle of so much beauty, as we do at The Golden K, it’s easy to hunker down and not venture very far. Why should we? Why not just sit and enjoy our five acre parcel of paradise with a glass of wine or cool beverage in hand? After dinner as we often do we can sit on the deck watching the bats harvest mosquitoes from the dusk sky while waiting for the stars to come out. Or we can go out back and watch the sun set as the night critters emerge and begin rustling through the forest. It’s a calmness that is special to us and one that we will never take for granted. But after dinner on this particular night Holly and I decided to take a ride up the hill to the town of Twain Harte. Twain Harte, like so many other foothill communities, has it’s own special vibe and personality. Saturday music in Eproson park was our destination. 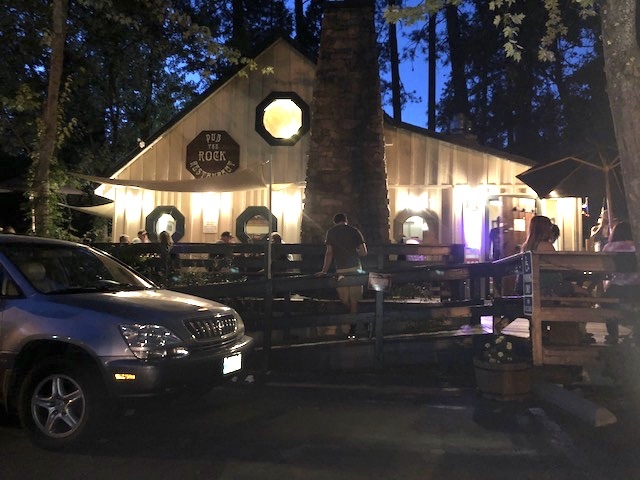 We packed the girls – our Golden Retrievers Kali and Kloe – in the car, headed out, and within 10 minutes we were sitting on the grass listening to music, and enjoying the warm Summer evening under the pines and community spirit. It took us 10 minutes. That’s just one the many great things about events in the Foothills. There is not a line of traffic between you and your destination, crowds are just the right size, most faces are familiar, and entry is usually free and prices for food and drinks are reasonable. I remember going to street fairs in Livermore where we lived for 23 years. It would take 20 minutes to go five miles to get to the event, we had to park several blocks – if not miles – away, and crowds numbered in the thousands. After fighting this dynamic for many years we just stopped going. The contrast between suburbia and the Foothills was striking as we sat listening to music and talking to people, many we had not met before. People do that in the Foothills – they talk to each other not because they always know you are but because you’re part of a “old fashioned” community in the Foothills where people are are genuinely interested. Plus our girls are great conversation starters! On this evening Kali and Kloe were the stars and main attraction of our own personal after-party. When the music at the park ended we walked down the street in the moonlit road to a popular pub called The Rock. 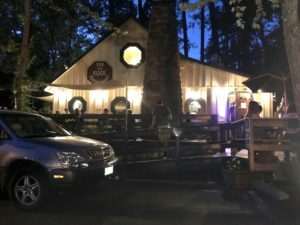 Twain Harte is a vacation town with many out-of-towners who come back year after year renting the same cabin or house with the same friends and family members. During the Summer there is a enhanced vibe with out oft owners who wish they could live there year round. Holly and I got a beer for us, some water for the girls, and came outside to enjoy the ambiance of the evening. Before we could say cheers there were several children hanging around the girls asking if they could meet and pet them. We told then of course they could. Our girls are so polite and love children. As our girls soaked up the love the vacationing children began to tell us about themselves and their families. A second group of children came over and we repeated the process. Before long some parents wondered over and asked about the girls and us. We learned where they lived and told them we lived down the road about five minutes. “Are you retired?” they asked. We told them no but living in this area, especially on nights like this, it felt like we were. It was a great exchange and example of the awesomeness of community in the Foothills. I was tempted to take photos of our girls with each and every child and vacationer we met. It’s that urge so many of us have to capture every minute of our lives to share on social media. I resisted the urge so as not to taint the moment. But, after an hour or so of community stewardship on our girls part, and as we walked away I took a picture of The Rock as we headed back to The Golden K with my romantic perspective of life at 3100 feet in tact.